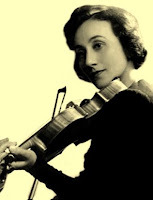 Erica Morini (Erika Morini) was an Austrian violinist born on January 5, 1904 (Heifetz was 3 years old.) Morini was known for a refined, silken tone and for being one of the few female concert violinists of the early twentieth century. She received her first instruction from her father (Oskar Morini, student of Joseph Joachim) and mother and completed her studies under the famous pedagogue Otakar Sevcik although she also studied with Jakob Grun, Alma Rose, and Adolf Busch. In 1916, she made her orchestral debut in Vienna, playing Mozart's A major concerto. In 1917, she made her debut in Berlin under Arthur Nikisch. Her U.S. debut in New York on January 26, 1921 (in Carnegie Hall) was a phenomenal success. She was 17 years old. Soon afterward, Maud Powell's Guadagnini violin was presented to her, though most likely only as a loan, since the instrument was later sold to Henry Ford, the car maker. She made her first visit to London in 1923. When she was 21, her father purchased the Davidoff Strad from a Paris dealer for her and that's the instrument she used for the remainder of her career. After 1938, Morini lived in New York City. She concertized far and wide until her retirement in 1976. She was 72 years old. It has been said that she taught Jascha Heifetz the bowing technique known as staccato. There are numerous recordings of hers still available and at least one video on YouTube. Some time in 1994 or 1995, her Stradivarius was stolen from her Fifth Avenue apartment but (according to one source), Morini was never told about the theft. It has not been heard from since. Whether the instrument was insured or not is unknown to me. Erica Morini died on October 31, 1995, in relative obscurity, at age 91.